The Korea Times even wrote up a piece on Brian leaving... given Brian's commentary on The Times' reporting, I read it carefully, looking for a hints of "Ding Dong, The Witch Is Dead!" in the tone. Given the controversy he courted at times - particularly during the Coreana Nazi ad, the summer of 2008, when netizens went after his job, and recently, calling out the IFriendly misfire for its bad English - and the sheer relevance of his posting, to expat life in Korea, some kind of send-off was certainly deserved. Brian was my personal choice for most relevant, and most topical K-blog of 2009 - the only other contender, in my opinion, is Popular Gusts - especially since the once excellent Korea Beat turned into one part of "Asian Correspondent" - which was probably good for the makers of the site, but which dilutes the once very straightforward, Korea-focused content of the site. 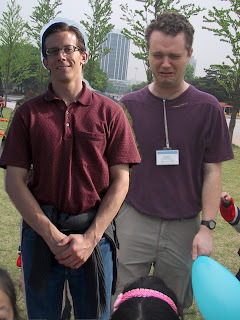 While Brian made some statements of regret about the time it took to maintain his blog, and what it's done for the name Brian Deutsch, at least in Korea, I think I can safely say that every blog reader and writer in Korea is very grateful for his work. I'll write him a letter of reference any time he wants. His blog has been extensive, well-written, amazingly prolific, and on the point timely. It's been an impressive run, and his absence will certainly leave a void in the K-blogosphere. Brian and I have hung out a few times: he's a good guy, nice, kind-spirited, soft-spoken, and his manners are WAY better than mine. Just to prove we really did hang out, here's a picture from the last time we hung out together: I didn't get permission to post this picture, but I hope he doesn't mind. His fiance is also super-awesome, charming and funny, and they're really cute together. Girlfriendoseyo took to them immediately, and gets a gubby happy face every time I mention them. There's one thing I'd like to say, for the record, about the title of the KT article: "'Angriest Blogger' Leaving Korea"
There aren't a whole lot of regrets, or things I wish I could take back, during the time I've run blogoseyo. For the most part, I'm happy to take the missteps in stride - I've fired off half-cocked a few times, I've failed to fact-check a few times, I've blundered in blogger courtesy before, and mistook a few trolls for real people, but most of it, I'll leave at "You live, you learn". One of the things I WOULD take back, given the chance, would be the Golden Klog category "Angriest K-Blogger" - The Hub of Sparkle is still showing security warnings, so I can't link it, but I think, looking back, that it was an unfair category in the first place, and worse still, that it unfairly saddled Brian with a reductionist label. I invented the category on a whim, and didn't really think about how the nominees would like being tagged that way. Sure, maybe his critical posts were strongly written; they were also some of his most popular, and frequently referenced posts, but they were also not the bulk of his output, by any stretch. The regional information, and the festival news were other areas Brian put in more effort than the criticism, and his criticism always had a reason, an explanation, and almost always suggested a solution, which is more than I can say for many of the other contenders for "Angriest Blogger" - who are usually harsh, petty, overblown, and prone to generalize specific cases in a way that Brian didn't. He never lost perspective, even when mad netizens were trying to have his job. A relevant article titled "Easy = True" that just showed up on "Givemesomethingtoread.com" makes the case that simple, snappy bits of information are taken to be more true than more complex explanations, expressions, or ideas. That's why a snappy neologism like "kimcheerleader" catches on: it's more fun to say than "Defensive Korean nationalist" "Korea booster" or "Korean ultra-nationalist". All advertising is built on that principle, and so is OJ's freedom (If the glove don't fit, you must acquit). I regret that "Angriest Blogger" was such an easy catchphrase, too contagious to fade into the background, and became the label by which Brian was known for the last year, even as he toned down the rage., because it mischaracterized a good guy, and a great blogger. Good luck in the future, Brian; we'll miss you here in Kblogland; eventually someone will take over as the go-to news source, but until then, the K-blogs will be a little less fun, and a little less interesting than they were from 2007-2009. You can't take it back, but maybe you could take it over. I've thought about writing a tribute, but this one seems to sum it up. Brian, if you need a second recommendation letter, I'd be happy to write one for you. And it'll include plenty of places to see the next time you're in Korea. Thanks for the kind words, Rob and Chris. I'm just now having a look at some of these responses to the Times piece. On the one hand, I can't be too angry about being the angriest blogger because I was kind of angry in 2008. In hindsight I could have gone about things better---and might not have touched controversial issues at all---but to be fair the mad cow stuff was very anger-inspiring. On the other hand, it's not my greatest achievement, and I'll have to get around to removing the "Hub of Sparkle" pic from my sidebar. I think people who cling to the idea of me being the angriest---especially with the surplus of pretty nasty,negative blog lately---are revealing their own prejudice against me formed years ago. I just noticed that my alma mater alumni magazine had a blurb up on their site about me, talking about how the angriest blogger is leaving Korea. I guess the title will come with me. Let the Ballot-box Stuffing Begin!